The Zamboanga del Sur-Pagadian Press Club Inc. (ZPPI) recently elected its new set of officers in a special meeting held at Hotel Guillermo last March 23, Saturday. In a press statement sent to The Philippine Preview, the ZPPI disclosed the election of Joan Guangco (Radyo Bagting) as the new president while Don Sherwin Lu (Pagadian Times) is the vice president. Other elected officers are Leah Agonoy (Philippine Daily Inquirer) as secretary; Charnyl Albaracin (Hardline Publications) as treasurer; Manny Maulana (InfoLink) as auditor and Jay Apales (One TV Philippines) as PIO. 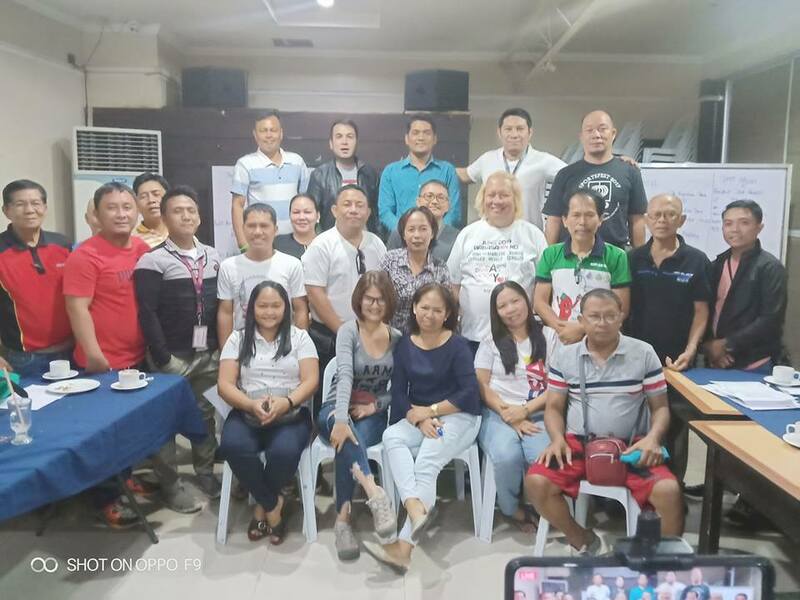 The members of the Board of Directors are Analiza Lu (Pagadian Times), Tony Bagalando (DXWO Radyo Bisdak), Aude Hampong (GMA-7), Leo Santillan (One TV Philippines), Gideon Corgue (Philippine Information Agency) and Efren Superal (STV). In her message, Guangco urged fellow media members to forge unity, support the organization and take the lead in enhanced and honest reporting despite the diversity efforts and individual relationships among the group. She likewise said ZPPI must use its capability in enhancing social consistency and refrain from inciting hatred, explaining the impact of the media on social solidarity is to promote ethical responsibility among practitioners by directing their efforts towards positive uses and make constructive criticisms among fellow members in times of challenges. In a message, Albarracin also said he is grateful for the initiatives of Remai Alejado, former ZPPI president and founding chair, for the determination to address ZPPI’s concern on the supposedly extended term of the serving president which has already ended last December 2018, citing the group’s by-laws. In another message to this paper, Alejado said she wanted to help ZPPI put its actions together so that the group can soon file its reports with the Securities and Exchange Commission (SEC). Under the law, all registered stock and non-stock corporations, foundations, associations, non-government and religious organizations and other entities are required by the SEC to submit a report on a regular or special basis. The SEC will penalize those who fail to file promptly. To date, ZPPI has more or less 60 active members. OZAMIZ CITY--Almost a year of hiding from authorities for drug trafficking, resigned Councilor Ricardo “Ardot” Parojinog was finally arrested in Pingtung County, Taiwan Wednesday, May 23, the Philippine National Police (PNP) confirmed yesterday. PNP spokesman, C/Supt. John Bulalacao told mediamen that Parojinog’s arrest came after a joint cooperation was made between the PNP and its counterpart in Taiwan. Parojinog was arrested in a raid by Taiwanese police at his rented house in Donggang, near evening following a tipoff. Intelligence reports from Interpol revealed that the councilor entered Taiwan using illegal documents and sought refuge in the fishing village of Donggang . Information from Taiwanese police also said they have been tracking Parojinog for illegal entry since April and located his hideout via his smartphone. This city's police office has since reported that Ardot had gone into hiding as early as January, last year, months before the raids were made on their houses. The PNP added that Ardot is being investigated and wanted for illegal possession of high-powered firearms he allegedly kept and was recently seized by policemen in a raid inside his mrop security agency office and Dottie's Inn business located here. The councilor's arrested cohorts tipped off authorities on his whereabouts, also said Police C/Insp. Jovie Espenido. As of press time, there is no definite date yet when Parojinog would be deported from Taiwan. President Rodrigo Duterte, who has offered a bounty of P5 million for Ardot's arrest, welcomed the councilor's arrest as a good news and assured Ozamiznons that Parojinog will be tried in due process for the charges leveled against him. When he became president, Duterte tagged the Parojinogs as key players of illegal drug activities in Ozamiz City and nearby areas. OZAMIZ CITY—Police operatives headed by Police Chief Insp. Jovie Espenido searched and examined for concealed items Dottie's Inn and MROP Security Agency--both businesses owned by former City Councilor and fugitive Ricardo “Ardot” Parojinog located in Banadero Highway, here, and recovered several high-powered firearms and bombs last early Monday dawn, April 30, a recent news relayed to The Philippine Preview said. Ardot is the brother of slain mayor Reynaldo “Aldong” Parojinog Sr. who has been on the move since his brother and 15 others were killed when they allegedly fought police raiders last July 2017. 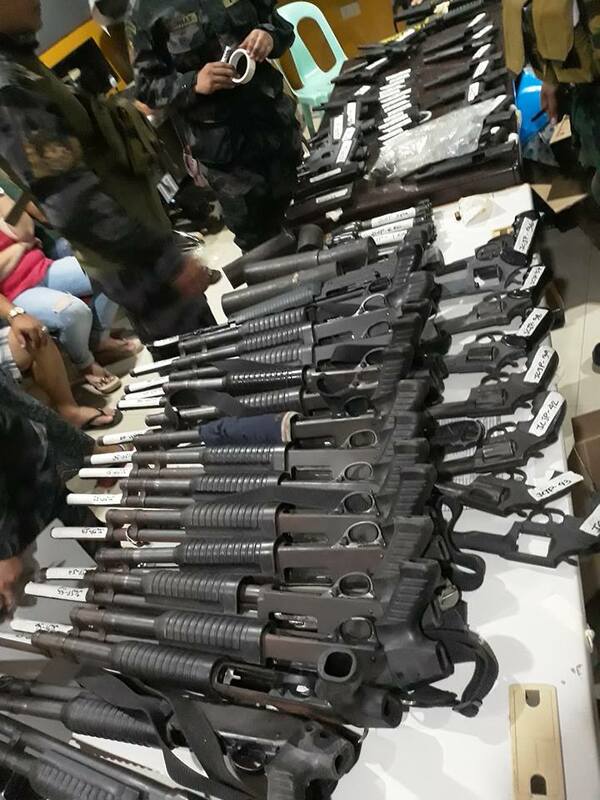 Espenido detailed to the media their confiscated firearms as two anti-tank rockets, two RPGs, three rifle grenades, 15 pieces 12-gauge shotguns, 18 pieces 9mm hand gun, eight .38 revolvers and an M16 rifle. The police also recovered 148 9mm live ammunitions, 73 pieces live .38 revolver bullets and 17 9mm magazines. Espenido remarked that all the seized weapons bear no serial numbers. He revealed that the police are acting from a tip of an informant who disclosed that guns and ammunition were being kept in Parojinog’s shut down establishments. The fugitive councilor and his aide were not around during the raid. But caretakers of their properties were taken for questioning, said Espenido. Presently, Parojinog carries a P5-million bounty for his capture and is was also placed on the Bureau of Immigration’s watch list. Later, another raid on a farm owned by Ian Dionson in Brgy. Sangay Dako yielded some 250 grams of suspected shabu, two rifle grenades, two 40 MM rifle grenades and another M16. Dionson, however, was not around during the raid, only the farm’s caretaker, Elmer Prenio, who was taken in for questioning. Last April 21, the Criminal Investigation and Detection Group (CIDG) in Northern Mindanao who raided the compound of a village chair in Kinawe, Libona, Bukidnon province, said they received reports that Parojinog was hiding there. OZAMIZ CITY— Reports from Pangasinan police confirmed their arrest on the identified aunt of the late Mayor Reynaldo Parojinog Sr., her husband and their son last April 19. The said report mentioned that they have in detention Councilor Rizalina “Peque” Francisco, husband Manuelito alias “Maning” or “Lapad” and son, June alias “Omboy”, ex-chieftain of San Roque, after they were stopped at a checkpoint along a Diversion Road in the village of Brgy. Bangcusay, San Fernando City. Police C/Supt. 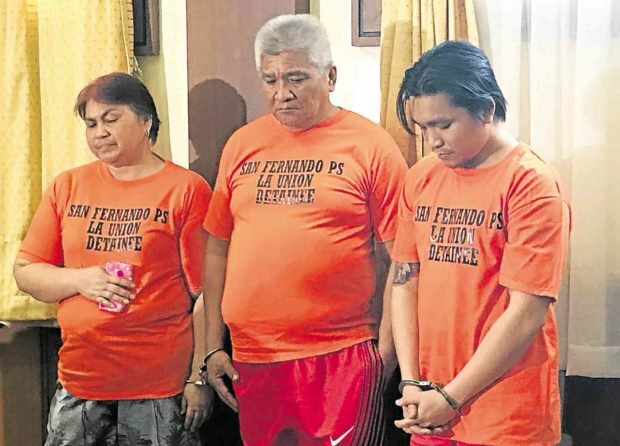 Romulo Sapitula, Ilocos police regional director, said the Franciscos were on their way back to Metro Manila with six other people in a rented Toyota Innova when they were stopped. According to the PNP, the Francisco couple was facing cases for illegal possession of firearms and explosives. Maning was marked as one of the organizer and planner of the dreaded Parojinog-Kuratong Baleleng Group which had been linked to cases of robbery, extortion, drug trafficking and contract killing. Another briefer stated that Francisco and his gang is known for its complex and advanced carnapping schemes in which expensive cars are stolen and released to the blackmarket. Earlier, television reports have said the Franciscos fled to Metro Manila and were allegedly in hiding after a police raid in their house where guns and explosives were recovered. A PNP report released last year said the Franciscos transferred from one place to another knowing they were being hunted by the police. A warrant of arrest against the Franciscos was issued by Presiding Judge Edmundo P. Pintac RTC 10th Judicial Region Br. 15, Ozamiz City, here, last Feb. 6 for violation of RA 9516. The suspects are now detained at the San Fernando Police Station and will be turned-over to the Regional Trial Court, here. In related news, an arrested village chief of Kinawe, Libona, Bukidnon town, is suspected to have coddled Councilor Ricardo “Ardot” Parojinog who has gone into hiding after the death of his brother and is now declared wanted by police. SPO4 Noel Oclarit, CIDG-Northern Mindanao chief investigator, said they arrested Cherry Barros and 18 others last Saturday. A joint team of police and military operatives served a search warrant for Barros but were fired upon as they were about to enter the Barros compound located in Zone 3, Kinawe. A firefight ensued that lasted for almost an hour and only when they ran out of bullets that the armed men surrendered to the authorities. Three soldiers were wounded in the confrontation, while 19 individuals were apprehended along with various types of firearms and ammunition confiscated at the crime scene. Cherry’s husband, Tarcisio and a still unidentified person were said to have escaped following the firefight as operatives continued their pursuit of the suspects who got away. Oclarit said the two persons who escaped during the raid were possibly hit and wounded owing to a trail of blood responding agents saw on a pavement. A Bombo Radyo report dated April 21 has recognized the unidentified person as Ricardo “Ardot” Parojinog, basing its report from CIDG Cagayan de Oro Team head Supt. Melgar Devaras who assessed a tip that Parojinog had been staying at the Barros compound, though they could not verify yet if he was one among those who managed to elude arrest. It can be recalled that the former councilor was included in the most wanted posters put up in this city last year by a group of concerned citizens. The Department of Justice has also placed him under the immigration lookout bulletin. He has a previous P1-million bounty for his arrest. But in September, last year, President Rodrigo Duterte offered a P5-million bounty for the capture of Parojinog and even encouraged soldiers to go to the mountains and hunt for him when they’re off duty. The awarding was held during the 67th founding anniversary of DSWD last March 8 at the DSWD Central Office in Quezon City headed by Development (DSWD) Officer-in-Charge (OIC) Emmanuel A. Leyco. Different awards were given like the “Salamat Po Awards,” “GAPAS Awards,” “Gawad Serbisyo” and “Gawad Ulat,” among others. In a report from the City Mayor’s office, it announced Acting Mayor Irene E. Luansing as one of the awardees in the Gawad Good Convergence Initiative for the local government's Pantawid Kolehiyo Program. Luansing was bestowed the award for her support in the college tuition of 86 scholars who are children of 4Ps beneficiary families. “This signifies her strong resolve to make education access a key long-term strategy in addressing poverty,” the press release from her office said. Fifteen other throughout the country vied for the award but only five made it to the final mark with Ozamiz City on top of the list, the press release further said. It was also known that the previous administration has left the said program unfunded for unknown reasons, as the press release stated, which Luansing readily took action when she became mayor. DSWD’s Leyco expressed his gratefulness in his speech for all the help given to the Department in pertinence to its mission, vision and goal to serve the Filipino people or every Filipino people in need.